Glock Factory Magazine, 45ACP. Fits Glock 30. Blued finish. 9-round capacity. 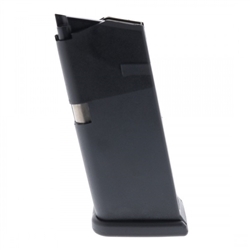 Glock magazines have a stiff metal tube encased in the proven Glock high-tech polymer. This resists deformation, even when dropped from great height or exposed to extreme environment conditions.